Computer customization, modification and Personalization. In mid 2003, I changed my computer and got a brand new one. One thing I did not like was the mouse pad - that thin piece of plastic which had ugly design. 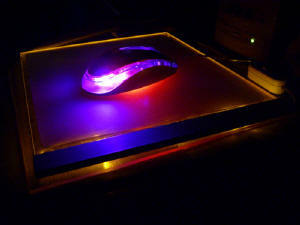 Instead of getting a new normal mouse pad, I decided to make my own glowing mouse pad. In the realm of computer modding (modification), this is probably one of the simplest and basic things one can do. Basically, by using the power from a USB outlet, we light up several LEDs of any colour into a piece of clear acrylic/Perspex/lexan. The edges will glow up, creating a nice even glow which makes a lovely addition to any desktop, which is exactly what I wanted with my new computer - to create a refreshing new look. This page documents my glow pad updates, and include comprehensive construction details so that you can make your own glow pad. With the right materials, it can be easily assembled in one afternoon. 2. Suitable mouse pad to put on top of the acrylic. 4. 3 5mm Ultra Bright 3V LEDs at 20mA. Whichever colours you want. I used 8mm thick acrylic. Too thin and it will be difficult to drill the holes of the LEDs. Too thick and it will fell uncomfortable. The thickness is up to you. I sawed mine to a 23x27cm size. Always remember to leave at least a 1cm border on one side to allow drilling the holes for the LEDs, and gluing the metal bracket down to conceal the electronics. Once sawed to the desired size, I clamped the acrylic down and drilled 3 holes, equally spaced apart at the side of the acrylic. 1. As long as the LED fits in, it's fine. Remember not to take off the protective covering until project is complete. It is to keep away all your greasy fingerprints and the scratches. 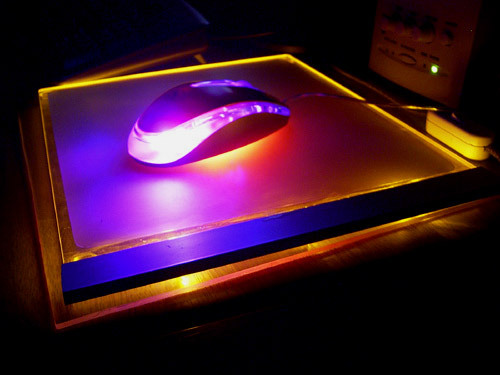 This glow pad runs on a USB connection. USB has an output of 5VDC, and we will be using this to power our LEDs. First splice up your USB cable. There should be 4 wires inside. We only need 2. Green and White: Data Wires. We won't need that. Here's my circuit and how I wired them up. Try to keep it as neat as possible. Once done, solder them together. I insulated all connections with heat shrink. It lights up! Ultra blue and bright! I used double sided tape to attach the aluminum bracket to the acrylic... that's before I get my epoxy. Now all you need to do now is to remove the protective covering, stick the 4 rubber legs and add your mouse pad on it. I am using a frosted sheet of plastic as the mousepad. It fits well with blue and has that cool frosty feeling. This is my completed glow pad. 1. 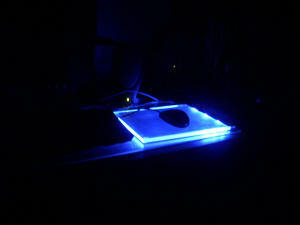 Glow pad at night.. makes a good night light. 2. The glow pad illuminating the surrounding. In February 2004, the double sided tape had totally lost the stickiness and came off. There were also some connection problems resulting in the LEDs not lighting up. I decided to redo the circuit. This time, I changed the blue LEDs with orange LEDs, for a change. I also added a nice switch and made the pad neater. The aluminum bracket was attached with a two part epoxy for a strong and permanent bond. I also bought a new optical mouse - A4 Tech Rainbow. It's a nice orange optical mouse with really lovely colours. This is the final result and is really quite lovely especially at night. 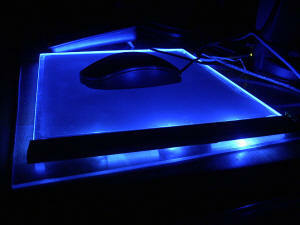 This is the current glow pad I am using.